this might be vegan-sacrilege to say, but in general i’m not very fond of faux meats. i am vegan for so many reasons and one of them is that i have a strong aversion to meats, and another is that i adore plants and naturally vegan dishes, such as my mainstay, dal. 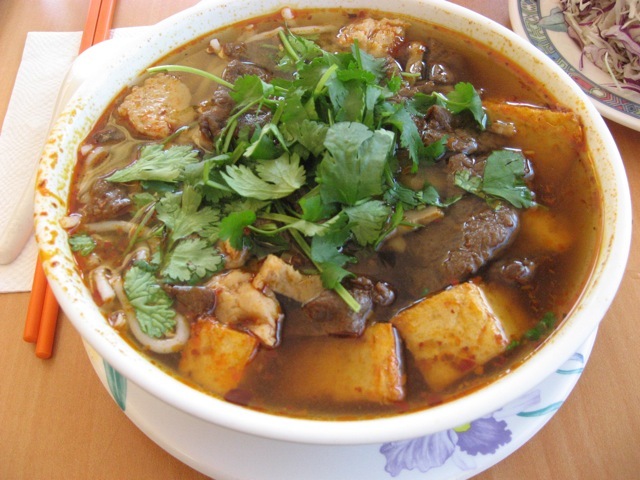 however, i am always curious to try new things and my curiosity led my friends and i to experience Vihn Loi Tofu in reseda and Real Food Daily (RFD) in santa monica. i’ve been to RFD numerous times but i haven’t added them to my blog yet, so this is perfect timing. this was my first experience at Vihn Loi and it was really fun. 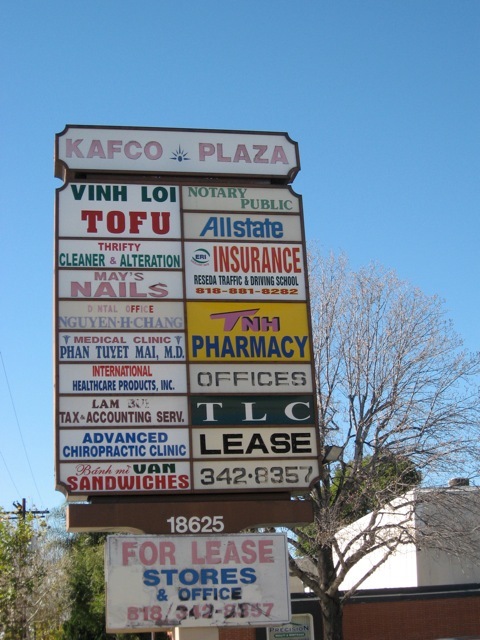 first off, this tiny vietnamese tofu factory is located in a ubiquitous little corner mall in reseda, so parking is not ample but you can easily find street parking. there are about a bamillion things to order but we kept it simple and all got soups. one of my friends also ordered a roll.. i think it was a veggie roll but i’m not sure. it was good though and i really enjoyed the dipping sauce. 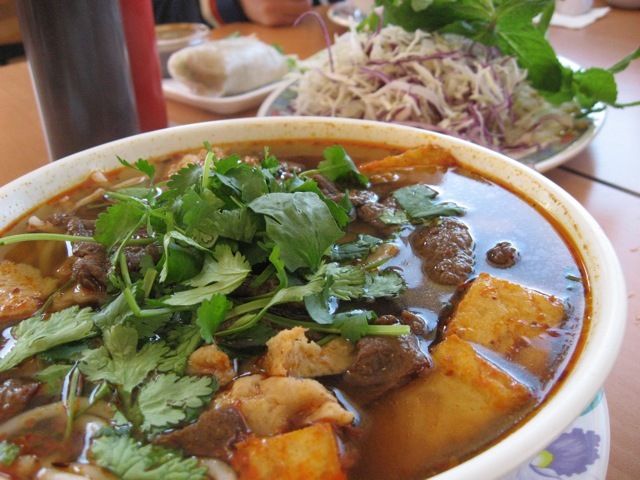 for lunch i ordered the bun bo hue, which is rice noodles in a spicy broth with seasoned lemongrass tofu, shiitake mushroom, vegan chicken and beef, served with red & green shredded cabbages, bean sprouts, mint leaves, and lime. wow, when the soup is on at Vihn Loi, it is ON! the portions are humungous, i ended up taking more than half of the soup home. i loved the mint leaves and lime flavour.. it really makes the soup fresh. the vegan chicken and beef have interesting textures.. it’s not meaty, but i found them to be chewy, maybe like a dumpling. the noodles were really fun to slurp up. i noticed that the menu said to let them know if you’re allergic to gluten.. i’m not sure how aware they are of gluten allergies, so if you’re gf then you’ll definitely want to ask. also, everything at Vihn Loi is 100% MSG-free and they use certified non-GMO soybeans! at RFD i ordered the yin yang salad with an add-on of blacked tempeh. 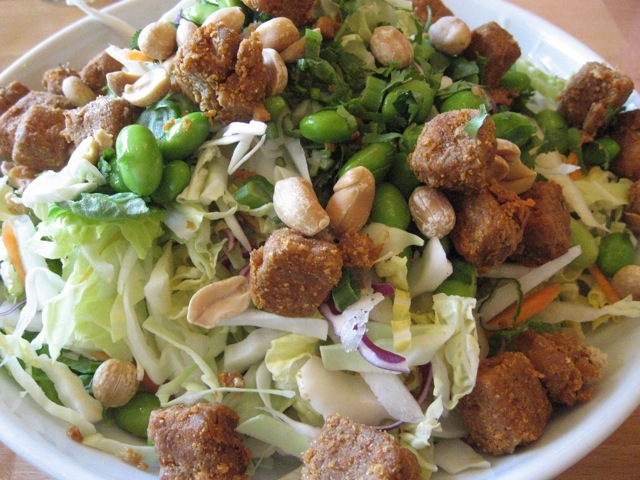 there was cabbage, romaine, carrots, cucumbers, edamame, cilantro, sesame seeds, peanuts, and peanut dressing. this was also quite a large salad and i had to take it home, but it was delicious and i’m glad i got to eat it twice! 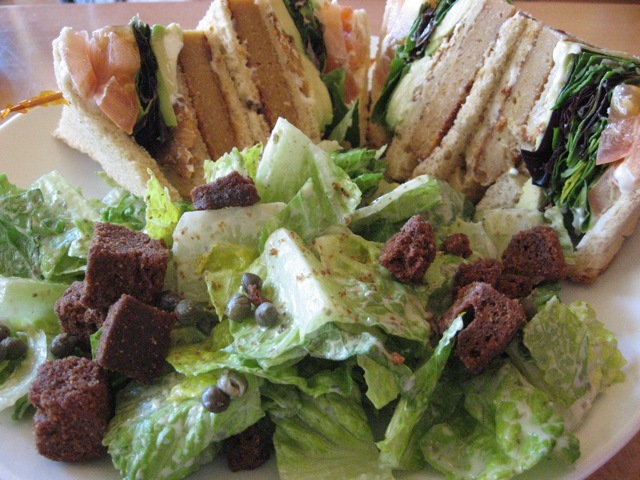 one of my friends ordered the club triple decker, which is seitan, tempeh bacon, avocado, lettuce, tomato, vegenaise, and sourdough bread, served next to a big caesar salad. i had a taste and the seitan really does taste like meat, which for me, i’m not crazy about, but it was interesting nonetheless. most of the times i have been to RFD have been with omnivores and usually carnivores, and they almost always end up enjoying the food. and i usually hear how their plant-based meal made them feel energetic and not heavy. YAY! on my way out i stopped in the RFD bakery (which is next door to the restaurant) and i got the pecan sour cream coffee cake to go. i don’t have a photo, but oh my gosh, it was so scrumptious! it reminded me of those hostess cinnamon coffee cakes i would eat as a kid.. but A LOT better, and better for you. This entry was posted on January 26, 2010 at 9:36 am	and is filed under gluten-free-friendly, los angeles, vegan, vegan bakery, vietnamese. Tagged: mock meats, real food daily, reseda, santa monica, tofu, vegan, vegan pho, vietnamese, vinh loi tofu. You can follow any responses to this entry through the RSS 2.0 feed. You can leave a response, or trackback from your own site.